TLV CO., LTD. received ASME Sect. III certification for its traps, strainers, and other miscellaneous items and parts, effective Nov. 12, 2010. ASME Section III sets forth regulations to ensure stringent quality assurance and appropriate implementation of technical knowledge for the purpose of the safety of nuclear facilities. It is the leading international standard for the construction of nuclear items. The present certification covers the construction of class 1, 2 and 3 traps, strainers and other miscellaneous items (N Stamp) and appurtenances (NPT Stamp) at its centralized plant in Kakogawa, Japan. TLV CO., LTD. has been supplying steam traps and other related products to nuclear power plants (NPP) in Japan for over 40 years. Our Free Float® steam traps, known for their reliability and long life, have become the standard trap type for condensate removal in NPP in Japan. 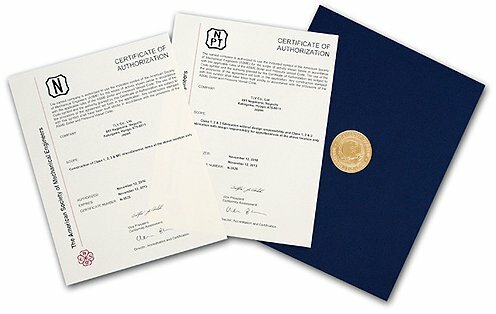 Obtaining this certification means that TLV's QA Program and the implementation thereof, from design to procurement, manufacturing, and inspection & examination, satisfy all applicable ASME Sect. III requirements. TLV works towards continuously improving the safety and reliability of steam systems in nuclear facilities by offering superior products of the utmost reliability, and by providing inspection and other services. The triennial survey was successfully passed and certifications were renewed in 2013.